WASHINGTON – The United States Mint (Mint) will begin accepting orders for 2018 American Eagle Gold Proof Coins on March 1 at noon Eastern Time (ET). The American Eagle Gold Proof Coins are the collector versions of the Mint’s American Eagle Gold Bullion Coins. Launched in 1986, these 22-karat gold coins display the “W” mint mark of the West Point Mint where they are produced. The coins’ obverse (heads) design features a version of Augustus Saint-Gaudens’ full-length figure of Liberty with flowing hair, holding a torch in her right hand and an olive branch in her left. The reverse design (tails), by sculptor Miley Busiek, features a male eagle carrying an olive branch while flying above a nest containing a female eagle and eaglets. Highlights of this year’s coin release include new packaging and the implementation of product and household order limits. Beginning this year, the Mint will now package individual coins and the four-coin sets in a satin-lined burgundy velvet presentation case, housed inside a burgundy outer box. All options include the customary Certificate of Authenticity. The Mint will limit orders to one per household per product option, across all sales channels, including bulk purchases for the first 24 hours of sales, after which the Mint will remove the limit. 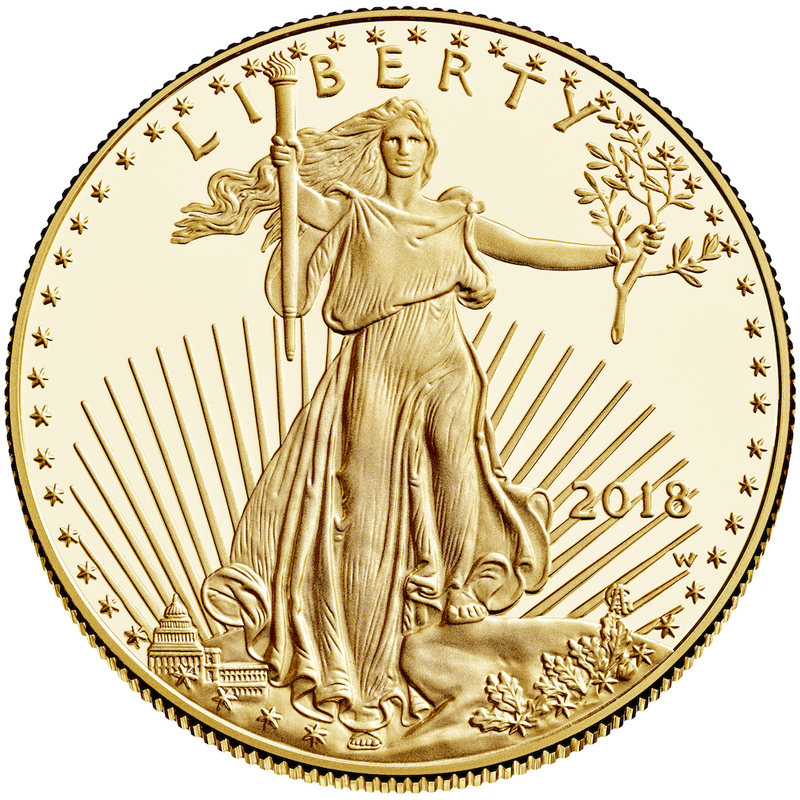 The American Eagle Gold Proof Coins are priced according to the range in which they appear on the Mint’s “2018 Pricing of Numismatic Gold, Commemorative Gold, and Platinum Products” table, available here. Customers may place orders at catalog.usmint.gov/ 1-800-USA-MINT (872-6468). Hearing- and speech-impaired customers with TTY equipment may order at 1-888-321-MINT. Information about shipping options is available at catalog.usmint.gov/customer-service/shipping.html.